Two years before the election, what are Labour’s prospects? A while ago, I ran an analysis of past election results, and how well they predict future election results. Some of what I wrote was focused on how Labour was doing 18 months after the last election (pretty well, compared with past Oppositions). But I also looked at how to interpret Labour’s poll score two years before the next election, which means May 2013 (see below for the key chart). Of the last 10 polls on UK Polling Report, seven give Labour a double-digit lead; the other three a lead of 4-8pts. So on the face of it, the model points to an electoral tie between Labour and the Tories – which would probably mean Labour being the largest party but just short of a majority. But there are a couple of reasons why you shouldn’t take this too seriously. 1) The model only claims to be able to predict 40% of the result of the next election. It accepts that other factors will be more important than current polls – a point made by John Rentoul in his comment on my analysis. That said, the other regression model – 18 months after the 2010 election – had better predictive power (0.59) and suggested Labour was on course for a 2pt lead, which is close to what the current model predicts. 2) The analysis mostly used polls when there were effectively only two major parties. This may make the model even less useful now. 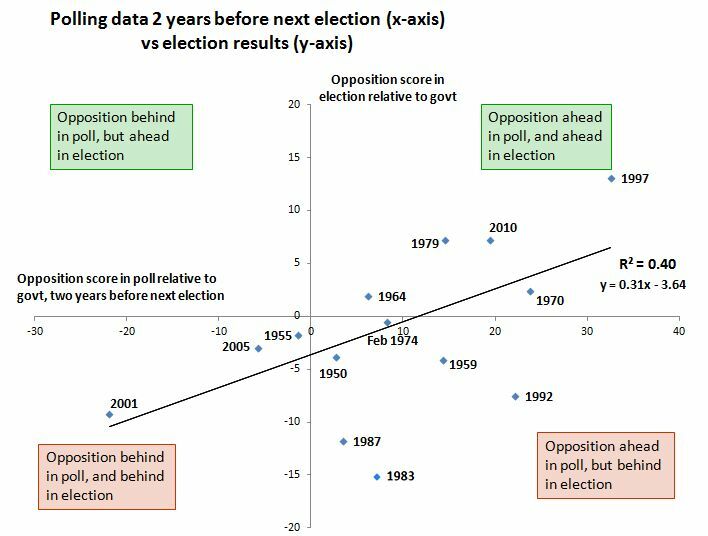 All the post-’92 election results have been better for the Opposition than the models predicted – perhaps the Lib Dems provided a home for people who in mid-term polls supported the Opposition, and in earlier elections might have then ended up voting for the Government. I don’t know what effect UKIP will have that isn’t factored into current polls, but if they’re still around they’ll be likely to similarly disrupt the model. So, as the chart shows, Opposition leads two years before an election, especially those in the region of 10pts, are not particularly meaningful. Oppositions have had smaller leads and won; they’ve had bigger leads and lost. If we’re to take anything from the two models, it’s that they suggest the election is looking close – but that the results depend more on what happens over the next 24 months than on how people currently say they’ll vote.